I wish I could share the aroma in my kitchen as I write this. I LOVE living in the country but there are some things I miss about living in the city and one of them is good bagels. One of the things I've learned to do after moving to our little slice of heaven on the mountain is make the stuff I can't find. Bagels are one of those things. Even country gals can whip up a good NY style bagel and I am not talking about those nasty bready things you buy in the grocery store. I'm talking about a nice chewy NY style bagel. They say the secret to a NY bagel is the water the bagels are boiled in that's only found in NY city. 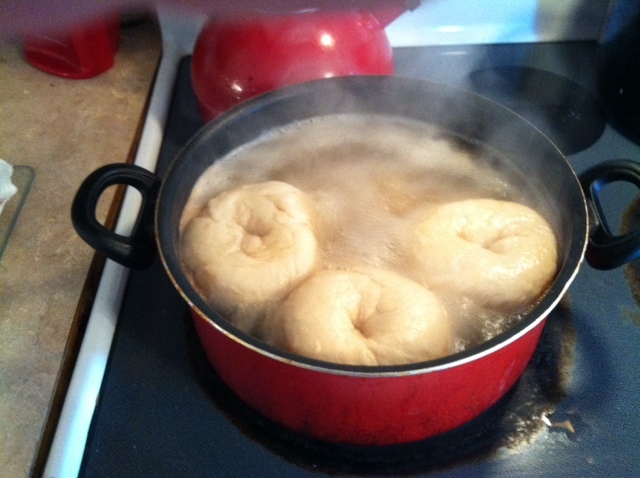 Well, since I'm way far away from NY city, I found a recipe that duplicates the water the bagels are boiled in as close to the water in the city as possible, and after tasting these babies, those of you who have eaten NY style bagels will surely agree! The secret ingredient is malt syrup. Since I live in the boonies and can't find malt syrup locally I had to order mine online. For those of you who live near well stocked health food stores, you'll probably be able to find it close by. I get my malt syrup from Barry Farm, but like I said, if you are in a city you can probably find it local. 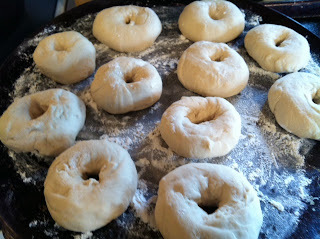 The other thing about bagel making is rolling or shaping them. Let me tell you, this is an art. My first few batches of bagels came out super ugly. Don't be discouraged if you can't get the rolling and shaping down on your first try. Although the recipe below calls for rolling the dough out like a snake, I have found that rolling the dough in a flat ball and then poking a whole int he middle with my finger while swinging it around and around makes the best shaped bagels, but experiment on your own and do what you like best. And finally...this recipe is for 8 bagels. I always double it or make 2-double batches. Let me know what you think! In a large mixing bowl, stir together water, yeast, and sugar. Let stand for 5 minutes. With a wooden spoon, stir in oil, malt and one cup of the flour. 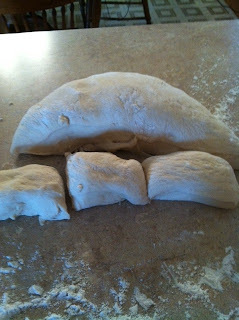 Add salt, then enough of remaining flour to make a stiff dough. On a lightly floured surface, knead for 10 to 12 minutes. Cover with a floured dish towel and allow dough to rest on a board for about 15 minutes. Divide dough into 8 sections and form each section into 10-inch long strips. Roll the ends together to seal and make a ring. Place on a lightly floured surface, cover, and let bagels rest 15 to 20 minutes, rising about halfway and becoming slightly puffy. Meanwhile, fill a large cooking pot or Dutch oven three quarters full with water. 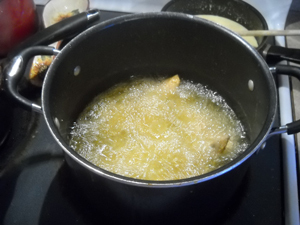 Add the malt syrup and salt. Bring water to a boil. Preheat oven to 450 degrees F. Line two large baking sheets with baking parchment and, if desired, sprinkle generously with corn meal. Set aside. Line two other baking sheets with a kitchen towel, set near your stove. Reduce boiling water to a simmer and cook 2 bagels at a time (do not crowd the pot). Simmer bagels for about 45 seconds on one side, then turn and cook other side for another 45 seconds and then drain bagels on the towel-lined baking sheet. Carefully place bagels on the parchment-lined baking sheets. 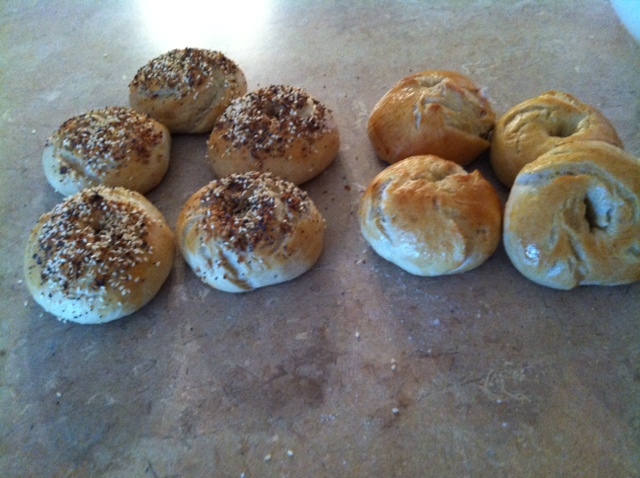 Bake bagels plain or sprinkle with a topping of your choice. 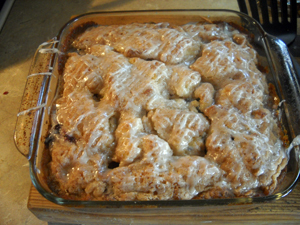 Place in the hot oven, immediately reduce heat to 425 degrees F, and bake about 17 to 25 minutes. When almost baked, turn bagels over (a pair of tongs do the job easily). If you have a baking stone, finish bagels on the stone directly. Transfer bagels to wire rack to cool. This is the first batch to come out of the oven...minus the 2 Mike took! With all of this time I have on my hands these days, I like to find new recipes to make for my guys. 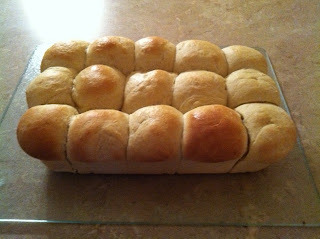 While searching for a quick and easy bread recipe to make with my roasted chicken dinner I came across the most incredible sweet dinner roll recipe. With a few modifications, it turned out to be one of the BEST breads I've ever made. Spread a little melted butter over the top when you take them out of the oven and then get ready for an amazing bread eating experience. They go well with just about anything... ENJOY!!! When cycle finishes, turn dough out onto a lightly floured surface. 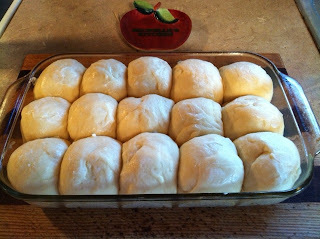 Depending on the size of the roll you want roll out 12-16 balls and place side by side in a greased baking dish. Cover with clean kitchen towel and put in a warm place, let rise 1 hour. Meanwhile, preheat oven to 400 degrees F (200 degrees C). Notes: I chose not to use my bread machine on this recipe, but instead used my Kitchen Aid stand mixer. I warmed the milk and water first, added the yeast and sugar to the mixing bowl and let it bubble for about 15 minutes. 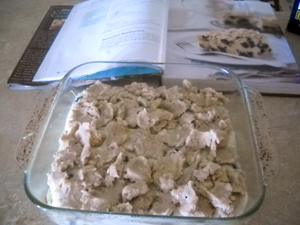 Then I added the rest of the ingredients (I added the flour 1/2 cup at a time). When I took the rolls the oven I slathered melted butter over the top and served them immediately. The rolls are great for breakfast and stored in a baggie can be used for a few days afterwards. Spring has sprung in east Tennessee and about a month early. It was kind of weird to be plowing the garden in late February, but I'm not complaining. It seems like everyone I talk to was ready to get their hands dirty and start planting. Who could blame us? The prices for food have continuously gone up while the quality continues to deteriorate. I can't tell you how tired I am of spending good money on crap produce and processed food. The good thing is, people are catching on and the movement to grow, bake, and make your own is gaining momentum! 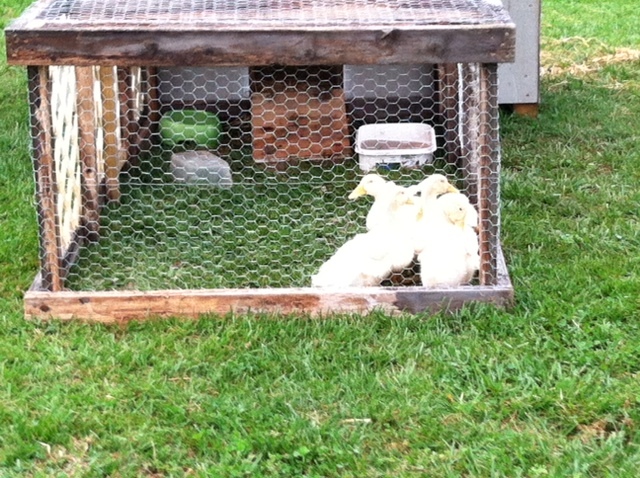 We have some newcomers to the ole' ranch - 5 Peking ducklings. They are simply adorable! Since I love to bake and they say duck eggs are THE BEST eggs to bake with, I'll be looking forward to trying them this summer. The little sweeties outgrew the indoor hutch in 2-weeks so Mike had to get busy building their permanent abode. we had a bunch of leftover materials from the dog house and chicken coop and an old building we took down, so the hutch is built from 98% recycled materials. In the process of building the hutch, he decided to add a small duck pond instead of using a plastic pool. The new house is done except for painting and flower boxes he promised to add for me, but the pond is still in the process. I'll post pictures when it's all done, but in the meantime here is a picture of the little darlings in their temporary run. We'll keep them penned until they get bigger to protect them. The chickens don't seem to mind the new additions, and they've all gotten along swimmingly (no pun intended). They eat together and hang out together and other than a few curious stares, we've had no problem integrating the ducks with the chickens. Speaking of chickens! It's only March and we're already getting on average, eleven eggs a day from the lovely ladies. They barely slowed down during the winter months. We've been a bit more careful about leaving them out all day after the coyote incident a few months ago, but they get out and stretch their little legs at least once every other day. Keeping them out of the strawberry patch is always fun. We'll have to fence the garden this year to make sure they don't destroy the plants. The garden is off to a GREAT start! I've got 28 San Marzano tomato plants started, 10 heads of cabbage, 8 basil plants, and beets all ready to go! I'll add beefsteak tomatoes and of course the yellow ones Mike loves so much. I can't WAIT for fried green tomatoes! Louie and I LOVE a good summer snack of fried green tomatoes with Ranch dressing. It's definitely a summertime favorite. I've got a list of other stuff but this is what I'm starting with. The most important thing is having plenty of tomatoes to can for the winter. I'll be adding corn, cukes (for pickles), pumpkins, melons, banana peppers, and anything else I can convince Mike to let me grow! Although the economy is still a mess and many people are limited in what they can do, I've discovered all kinds of wonderful things by simply not worrying about things you can't change and focusing on how to make the best of what I have. Honestly? I've realized how much I've taken for granted all these years and how much we really do have. I'm loving the country life more than ever and look forward to the adventures this lifestyle brings every day! Willow Tree Ranch - Chickens and Goats and Ducks OH MY! Ok, so I promised I wouldn't stay away so long, and I had every intention of keeping that promise, but then life happened and before I knew it, 2 months have passed. Eeeesh, I've never gone 2-months without updating my blog. BUT, as with SO MANY other things this year, there's lot's of stuff going on here on English Mountain. As I previously mentioned in an early update, my nest is emptying pretty quick. This is a transition year for our family. It's the first year that all of my brood won't be here to celebrate this super special time of year. Louie, my youngest is here for this year and next and then he's off to either Collage via the Air Force ROTC program OR straight to the Air Force via enlistment, depending on the options available to him his senior year. Ashley is doing pretty good in Japan. The Navy just approved her off base apartment (she has a view of the ocean!) and she'll be moving in any day. Although she is adjusting to being away from home, she still calls at least 4 times each week and at least one of those calls starts off with tears and her telling us how much she wants to come home. These calls are the hardest. Not really being in the holiday spirit this year, I had no desire to go all out with decorating, but Louie went out to the barn the day after thanksgiving and lugged all the decorations in and well...we decorated. We played our official family decorating song and even though I had to step into the other room a few times to cry (I missed my baby girl), we had a good time and the house looks pretty good albeit, a little toned down this year. We've also decided that we're not going to go haywire with our shopping. After watching the Black Friday news reports and seeing how the season has gone from a time of giving and time spent with family to a totally greed and materialistic driven joke, I refuse to participate. This year we'll try to buy the gifts we do purchase from companies who are in our local community. This past year has been tough on almost everyone I know. I do believe something good can come from the struggles many of us have faced. I think a lot of people are waking up to the reality that we've sold ourselves out in years past for things that have had little or no importance when it really mattered. That flat screen TV won't fetch enough to pay a mortgage payment in most cases. I'm encouraged to see SO MANY people working to change that. Not a day goes by that I don't meet someone who is starting their own self-sufficient mission and I say "GOOD FOR THEM THAT DO!!" With Mike headed towards retirement in a few years we've been talking a lot about what we want to do when he leaves the police force. Although he'll probably do some teaching at the local colleges and University of Tennessee, we're thinking of ways to utilize the land we have. We're officially starting our own mini-ranch which we're going to call Willow Tree Ranch. HOW AWESOME IS THAT?? We're going into this slowly. Next spring we're expanding the garden a bit, adding beehives (just 2) to our 17 chickens and we'll be adding 5 ducks and a few dairy goats by summer. Since Louie will be leaving home soon, we want to make sure we can handle the amount of work these new additions will add to our days. With my new goats, I'm planning on making Artisan cheeses and soaps. The bees will provide honey to sell as well as cook and bake with and the duck eggs will come in handy for baking as well. We'll start with that and see how we do and if all goes well, we're going to add 2 horses in Spring 2013. Please don't hesitate to offer advice if you're already raising bees or goats. I'm open to all the advice I can get and I'd love to hear about your animal adventures! 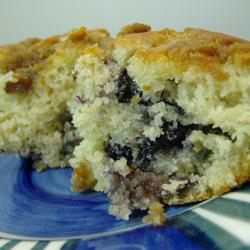 On this official last day of summer, I decided to finish the season of with a delectable Blueberry Buckle Cake that can be eaten as an after BBQ dessert OR a morning coffee cake. Either way, it starts the day out or ends a summer backyard feast with the same delicious taste. 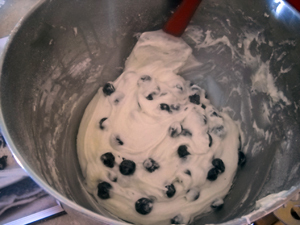 I used fresh blueberries in mine as I like how they retain some of the consistency during baking, but frozen berries can be used as well. Ah, the scorching days of summer are almost at an end. And not a moment too soon if you ask me. Has it been HOT this year or WHAT? I don't care what anyone says, global warming is in full effect here on the mountain. Every year it gets hotter and hotter and by Labor Day, I am SO ready for Autumn to swoop in and cool things off. I tend to get a good energy burst at this time of the year,and since I don't have a lot to do on the work front, I've decided to focus all of my energy on the house and property and of course, cooking! I LOVE to cook! This past weekend while Mike and Louie mowed, clipped, weed whacked and basically addressed the outside chores, I decided to treat them to a nice end-of-summer dinner of country fried chicken, homemade mac and cheese, green beans simmered with ham and onion,s and watermelon! Mmmmmmmmm, it was sooo good. Here's my not so secret recipe, feel free to improvise, you really can't screw this up! 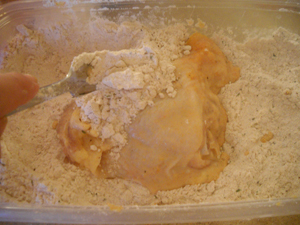 Rub chicken with salt, pepper, a little bit of garlic, and any other spices you want to throw in. 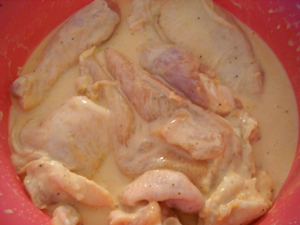 Soak the chicken in a large bowl with the butter milk. In a large bowl, combine the first six ingredients. 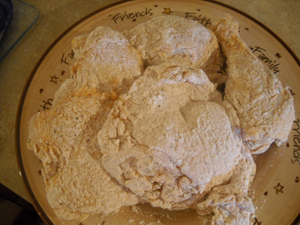 Add chicken to flour mixture, a few pieces at a time, and shake to coat. Dip into buttermilk, then return to flour mixture and coat again. Let stand for 5 minutes. Heat about 2 in. of oil in a large skillet. 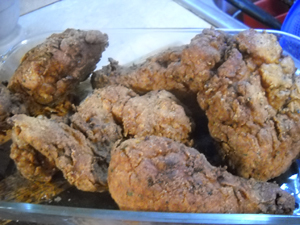 Fry chicken until golden brown on all sides. Reduce heat to medium and cook until a meat thermometer reads 180°, about 20 minutes. Keep finished pieces in a warm oven until time to serve. *Note* If chicken pieces are large, you will want to use a knife and check to make sure the centers are done, you can fry the chicken for 20 minutes and then place in a 350 degree oven and bake an additional 20 minutes to ensure they are done. They will retain the crispiness. This chicken is a great picnic item too. Fry some up, pack it in a basket with some potato salad, biscuits, and a nice apple pie, and find a nice lake enjoy a meal with family!! While my daughter was on leave this summer she shared a story with us that reminded me that there is STILL some good in this world. Ashley and several of her shipmates were traveling from Chicago to Meridian, MS, but had to lay over in Atlanta. The kids had a 2-hour wait and were basically running on no sleep so they set out to find a Starbucks to load up on caffeine to get them through the next leg of their journey. The kids walked into Starbucks, all 7 or 8 of them, and placed their orders. In the process of placing their orders a man came into the cafe and pushed his way to the front of the line in front of the kids. They were all wondering what the heck this guy was doing. Ashley said the man blocked the Sailors from paying for their purchase, he told the cashier, "I've got this, all of them" and proceeded to pay for ALL of their drinks and snacks. He walked up to each of them and shook their hand and told them, "It's the least I can do for you for what you're doing for us, thank you". And then he left. This single act of appreciation had such a profound impact on these kids. They all just stood there staring at each other like "What the heck just happened?". They had experienced their first act of gratitude from a total stranger. And it was this total stranger who restored my faith in my fellow man. As my daughter shared the story, I had tears running down my face. People come up to her, total strangers, and hug her or shake her hand and thank her. I don't know if they are Democrat or Republican, all I know is... for at least just this once, we are in unity and agree and our hearts are all in the same place. I've been feeling kind of down lately. I chalk it up to all of the negative things that wash over us every day via the news media as well as the hate and discontent amongst my fellow countrymen. it seems that no one agrees on anything these days and it isn't just a matter of disagreeing, it's so volatile. Believe what you want, but if you're going to believe it, at least make sure that what you're believing is the truth and based on facts. So FEW people do that these days. Don't be a pawn in a game none of us are destine to win, but instead only the politicians who use our differences to separate us. I know there are many military and police families out there that feel the same way I do. Yet, when people get together all they can focus on is their difference of opinions. We owe our troops more than that right now, we owe them unity. Only a military family knows how tough it is to be away from the one you love. Only a police wife knows what it's like to lay awake at night until she hears that car pull up in the driveway telling her he's home safe another night. And only a military mother knows how hard it is to watch her baby go off to serve their country, usually thousands of miles away from home and mom's help. Here is a video that makes me forget the difference of opinion I have with my neighbors, this video reminds me we are ALL in this together! © Shell Washam. All rights reserved. For Under the Willow Tree. www.underthewillowtree.net. Simple theme. Powered by Blogger.